The Emerging Leaders Program is a great opportunity to connect with other early to mid-career professionals who want to make a difference for New York’s environment. 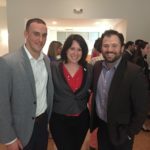 Emerging Leaders at NYLCV enjoy events throughout the year, with opportunities to engage with other NYLCV members and discuss the environmental issues in New York that matter most to them. In addition to our signature happy hour invitations, members of our Emerging Leaders Program are given access to our breakfast speaker series and cultivation events, in addition to exclusive pricing and invitations to a variety of NYLCV events, such as our signature Spring Gala, our New York City Cocktail Party, and more. Membership is $50 for the year and can be fulfilled with either a contribution to NYLCV or by purchasing a ticket to one of our signature happy hour events. Become a member today! Our Emerging Leaders events are designed to engage younger environmentalists, students, early-career professionals, and develop a stronger bond between the environmental and political communities. 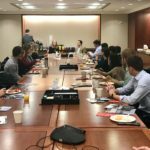 Breakfast Speaker Series: In 2016 we hosted our first Breakfast Speaker Series for our Emerging Leaders, with Noreen Doyle, Executive Vice President of the Hudson River Park Trust, and Tony Simone, Director of External Affairs at Friends of Hudson River Park. 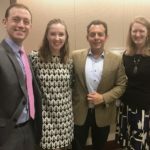 In 2017 we hosted a breakfast in the spring featuring Kathryn Garcia, Commissioner of the New York City Department of Sanitation, and in the fall featuring Alex Matthiessen, Move NY Campaign Founder and Director. We hope to have more of these breakfasts to hear from prominent business, environmental and political leaders, and speak candidly about advancing environmental and economic sustainability throughout the state. 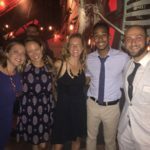 Cultivation Events: We have a number of small cultivation events every year, to thank our Emerging Leaders for all their environmental efforts, and give them an opportunity to network with one another in an informal setting. Steering Committee members host between 15 and 20 NYLCV Emerging Leaders, for an evening of drinks, appetizers and networking with other early to mid-career environmental professionals. Happy Hour Events: Our most popular events every year are our two signature happy hour events! Around 100 Emerging Leaders gather in the winter and summer to enjoy beer, wine and hors-d’oeuvres with future leaders of New York’s environmental movement. Guests to this event typically include board members, corporate supporters, politicians, activist and other Emerging Leaders. In 2016, we were lucky enough to welcome City Council Member Margaret Chin at our winter event, who discussed her work to place a fee on single-use plastic bags in New York City, and Council Member Antonio Reynoso at our summer event, who discussed his role as Chair of the Sanitation Committee. In the winter of 2017 we were excited to hear from Mark Chambers, Director of the NYC Mayor’s Office of Sustainability, who discussed what NYC is doing to lead the fight against climate change and fill the void left by our federal government; and Molly Hartman, Mayor de Blasio’s Senior Advisor for Food Policy, was our featured speaker this summer, discussing the nexus of food, farms, and organic waste issues in New York City. Our Emerging Leaders Steering Committee is comprised of NYLCV and NYLCV Education Fund board members and supporters, who help guide the priorities of the Emerging Leaders Program. We’re always looking to expand our Steering Committee to represent a diverse group of environmentalists from civic, business, and nonprofit backgrounds. The committee is the perfect opportunity for you or your organization to get involved in cultivating the next wave of environmental leaders who will make New York’s future greener. As a member of the Steering Committee, your name or the name of your organization will be listed on the invitation and you commit to raising $250 or bringing at least five people to each happy hour event throughout the year. Steering Committee members also get exclusive access to our NYLCV Annual Board Meeting Reception, and more.